AFC Fylde boss Dave Challinor believes the club will retain their top players this summer. 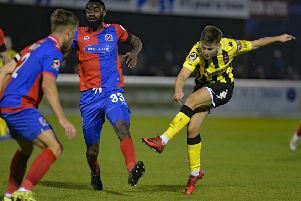 The Coasters exceeded expectations during their inaugural National League season, with several stars catching the eye, none more so than National League Player of the Year Danny Rowe. The club’s record goalscorer bagged another 30 goals as the Coasters gatecrashed the play-offs and Challinor is surprised that there has been no serious interest in the prolific hitman over the years. Challinor said: “This is one that always divides opinion and brings up discussions around why there has never been any serious interest in Rowey. “It is something I have spoken to Rowey about many times over the years. “Perhaps he is now at an age where clubs feel like it is too much of a risk. He’s 29 now and maybe the potential outlay for a player of that age is too high. “There is a misconception that he is on daft money here, which just isn’t the case. There is also the misconception that no amount of money could prise him away. “Every club has to accept bids at some point, whatever the level, but it isn’t something we are even considering at the moment. “Over the course of the four years that he has been here, there has only been one bid and it was embarrassing for someone of Rowey’s quality. “He spent the earlier stages of his career floating around clubs where he struggled for games and goals, but has now been settled for the last four years back ‘home’. “He’s back around his family and friends in an area that he knows and that has shown on the pitch. “We’ve always asked him to be the best he can be and to continue improving and that will be the same next year. “Regardless of what he has done over the last few years, he will still have to go out there next season and prove his doubters wrong. “If clubs do come sniffing around him with serious interest then it’s out of my hands, but we are not in a position where we have to sell. “People will have the opinion that he our best player. He’s certainly our most difficult to replace.